Precut tabs feature white inserts that can be typed, handwritten, laser or inkjet printed. Preset layouts in WordPerfect and Microsoft Word. 1/3" tab extension. Permanent adhesive. 25 tabs per pack. Item as described and arrived promptly. We, as a department, have used a lot of these tabs on my recommendation. We put together a lot of binders and these tabs work wonderfully. When printed on the computer they look very professional and clean. The ability to duplicate names/info is a lifesaver. Transcript: These are Avery 1" Assorted Self-Adhesive Plastic Tabs! They come with two sheets of labels with printing instructions. In the box are five colors: green, red, yellow, clear, and blue. To put a tab on any page, first choose your page and the placement of the tab. Then remove the white release liner on one side of the tab. Place this on a the edge of a page. Then remove the other liner and stick it on. Next, with your label made, fold it up and insert it in for some customizable organization. 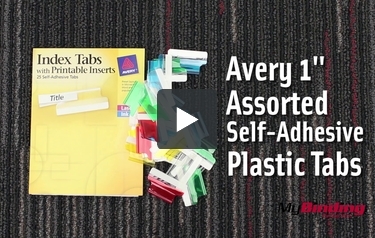 These are Avery 1" Assorted Self-Adhesive Plastic Tabs!